Playing the guitar is definitely a great hobby to have for everyone. It certainly is fun and offers a lot of awesome benefits. However, in this article, I would like to pay your attention to the disadvantages of playing the guitar. Many players (especially beginners) are either not aware of these problems or simply choose to ignore them. Either way is not good and can potentially cause health issues in a long term. Today we are taking a look at common problems many guitarists have and how you can prevent your body from serious injuries in a long run. 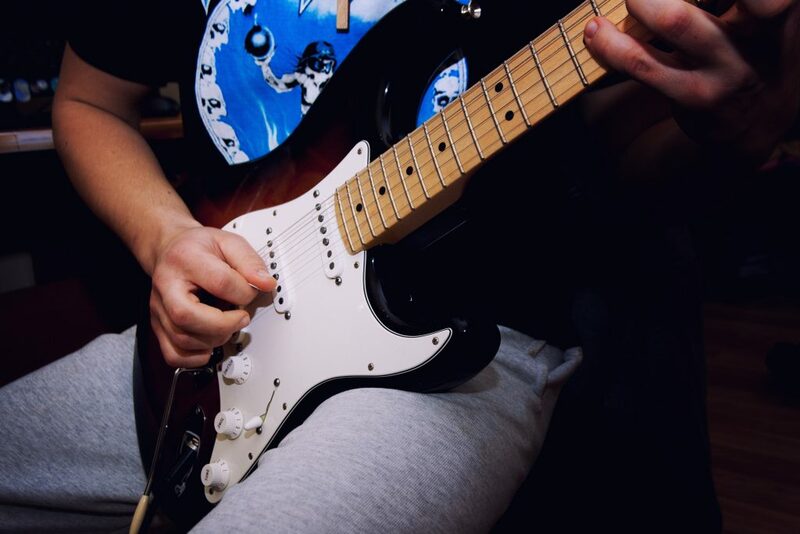 Wrist pain is a very common problem among guitar players. 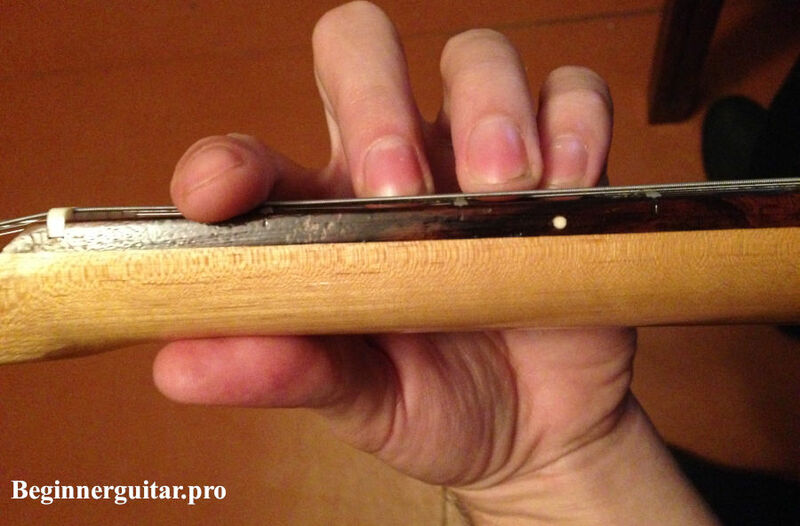 While it can affect both fretting and picking/strumming hands, most often it becomes a serious issue for the fretting hand. This is especially common among beginner guitarists since at this stage they haven’t yet found comfortable positions for holding the guitar and positioning their body. You can clearly see the angle between the wrist and the arm. This is a very unnatural position for human’s hand and obviously maintaining that fretting hand position angle will cause pain and discomfort even when playing guitar for a short period of time. Besides obviously causing pain and cramps in your hand, this position offers very little strength for your grab, making it very hard to play barre or any other chords properly. Keep in mind that I am not an expert or a doctor and this article should be treated as a recommendation. I have been playing the guitar for over 9 years and I have never had a problem with wrist pain mainly because I was warned about this issue just when I started. Pay attention to how my wrist extends my arm in a straight line instead of being bent to the right. Not only my wrist feels totally comfortable this way, but also I have a stronger grip and can keep my hand in such a position for much longer without feeling tiredness. Besides, this hand position allows you to play guitar much faster. There is surprisingly little information on how playing guitar impacts your posture. A great majority of guitarists are slouching while playing guitar and that doing that for prolonged periods of time impacts our posture. We get used to the way guitarists look from the front. 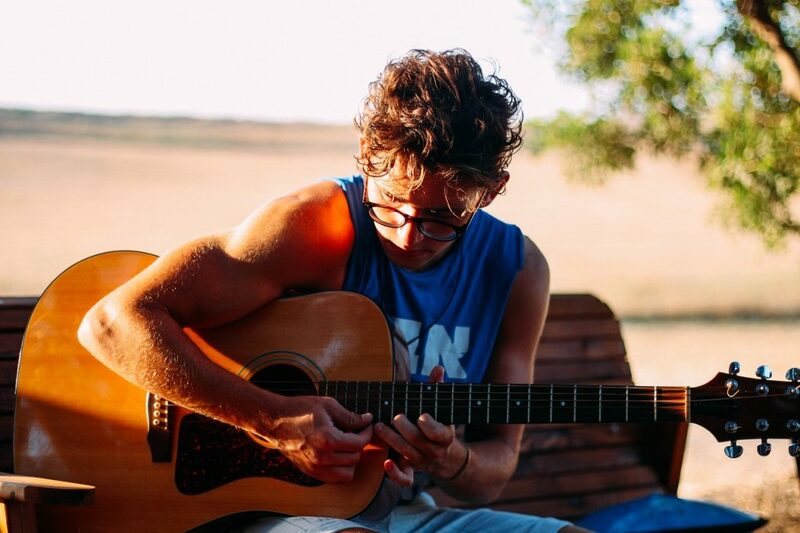 But when you look at someone playing guitar from a side or behind – you will clearly notice that often times he or she will be slouching and tilting forward. The problem of maintaining proper posture when playing guitar is especially important for children and beginners (or both). Most of the times beginners need to see the fretboard when playing licks or riffs. This makes them tilt their head forwards, causing pain in middle/upper back, shoulders and neck. Very often the habit of tilting forward when playing guitar remains even as the times goes by. Over time minor inconveniences may turn to neck pain, shoulder pain and injuries, back pain, a nerd neck, scoliosis or even a hump. 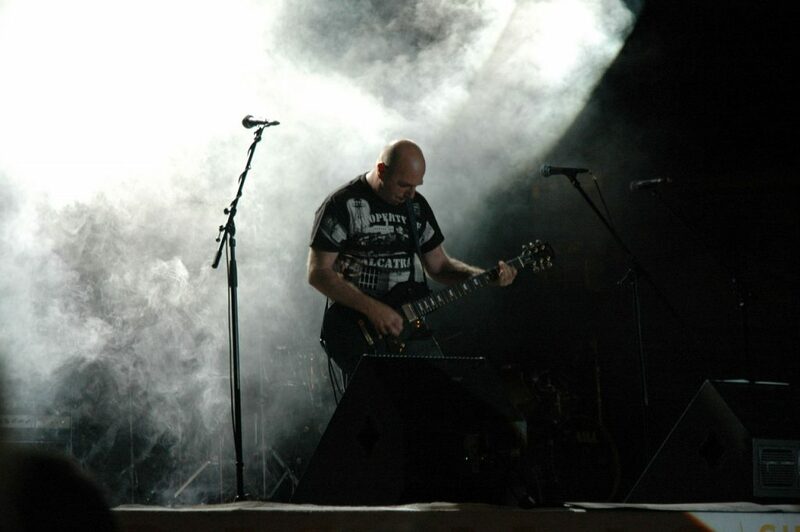 Sometimes even professional guitarists suffer from bad posture caused by spending too much time of their life holding a heavy electric guitar. In one of his interviews Paul Gilbert admitted that his tilted posture is caused by a heavy electric guitar (I promise to link to the interview once I find it). 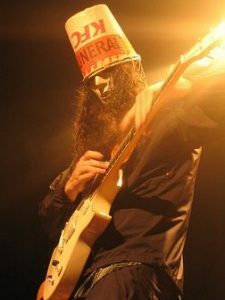 While being one of the fastest and the most inspiring guitar players EVER, Buckethead doesn’t have a single social media account. His website looks like it’s from 1998 (http://bucketheadpikes.com/). However, in 2017 he actually gave a real interview, which was a talk with his therapist, where he admitted that he suffered from bad posture and back problems for a long time. He had to ask for professional help. He had to do workout exercises until he finally felt better. Exercises helped his back problems and (according to the interview) now he feels much better and doesn’t hunch forward as much as he would in the past. 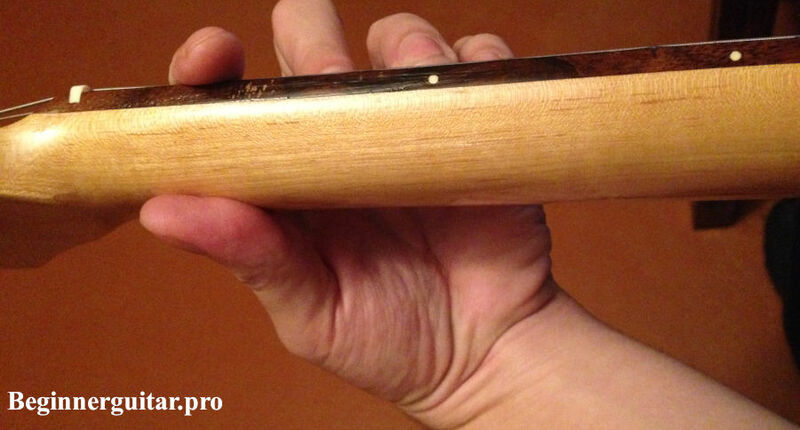 So how do you prevent guitar posture problems? Again, I am not an expert of any kind, I can only recommend what works for me and what I learn from professional guitarists that I know personally or through the internet. My tip for you is to hold a guitar the way classical guitar players do. Yes, it may look nerdy and not cool. It is actually very helpful for various parts of your body that usually are in pain when you play the guitar. Here is a quick recap of what parts of your body are in pain when you are holding the guitar “the cool way” just like the cool kids do. Make sure you check out this short video lesson by German Brad Pitt, one of my favorite guitar teachers on Youtube. Have you had any of the health problems mentioned in this article? Is there any guitar health problem you would add to the list?